Municipal Complex before December 1999 fire. Police Department Located at 248 Hamilton Avenue. Residents are welcome at these meetings. Garage Sale -- two garage sales are permitted per year. 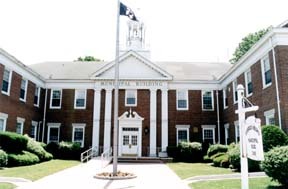 A permit may be obtained from the Borough Clerk's Office. Dog License -- Each dog must be licensed annually. Licenses may be obtained from the Board of Health. Burglar Alarms -- All alarms must be registered with the Police Department and a permit must be obtained from the Borough Clerk's Office. Overnight Parking -- There is no parking on all Borough streets between the hours of 2:00 a.m. and 6:00 a.m. In case of an emergency please call the Police Department 288-1000 for instructions. Recycling -- Recycling is mandatory. Recycling calendars may be obtained from the Department of Public Works. Woodland Park Picnic Facilities -- A permit must be obtained from the Borough Clerk's Office for use of picnic facilities. Recreation Department -- Programs are ongoing all year. For information - 288-4143. Department of Public Works -- Monday through Friday, 8:00 a.m. to 4:30 p.m.. Summer hours 7:00 a.m. to 3:30 p.m. A calendar explaining recycling and solid waste pickup can be obtained at the Municipal Building or at the Public Library. For further information -- 288-1072. Record Bureau -- Police/Accident Reports available to be picked up -- Tuesday through Friday, 9:00 a.m. to 4:30 p.m. -- 288-6020. Fire Chiefs Office -- Tuesday through Friday, 9:00 a.m. to 11:45 a.m and 12:45 p.m. to 4:00 p.m. -- 288-0082. Fire Prevention Bureau -- Tuesday through Friday 9:00 a.m. to 11:45 a.m. and 12:45 p.m. to 4:00 p.m.. For payment of fines -- 10:00 a.m. to 11:30 a.m. and 1:00 p.m. to 2:30 p.m. -- 288-4110.